Philippe de Montebello was the longest-serving Director of the Metropolitan Museum of Art in New York (1977-2008). Martin Gayford was an acclaimed art critic. Their book, Rendez-Vous with Art, is structured around the conversations they had in churches, museums, and art galleries around the world. It’s an intimate look into the pleasures and pitfalls of art. Starting with a fragment that’s left of the face of an Egyptian woman who lived 3,000 years ago, de Montebello and Gayford’s book confronts the elusive questions: how and why do we look at art? That is a large subject we will leave you to explore, but there are two parts of this book we wish to draw your attention to. 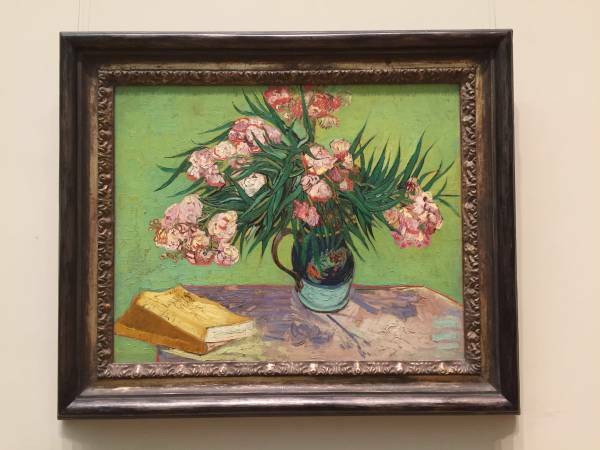 As far as the object, Van Gogh’s Irises and Roses collection comes to mind. Van Gogh employed bright pigments in a way that encouraged them to lose their vibrancy over time, anticipating “time will only soften them too much.” The contrast between the originals and those we witness today is stark — color like all living organisms fades over time. But even more important than the physical evolution of pieces are the ones happening internal to us. Inevitably, we all inhabit a world of dissolving perspectives and ever-shifting views. The present is always moving, so from that vantage point the past constantly changes in appearance. That is on the grand, historical scale; but the same is true of our personal encounters with art, from the day to day. You can stand in front of Velazquez’s Las Meninas a thousand times, and every time it will be different because you will be altered: tired or full of energy, or dissimilar from your previous self in a multitude of ways. … Our idea was to make a book that was neither art history not art criticism but an experiment in shared appreciation. It is, in other words, an attempt to get at not history or theory but the actual experience of looking at art: what it feels like on a particular occasion, which is of course the only way any of us can ever look at anything. In Europe, one often has a sense that a selection has been made by paring down a lot of inherited dynastic objects or spoils of colonization or war. Then a curatorial mind has built on that base. In the USA, you start ab initio. American museums large and small tend to be encyclopedic, whether you are in Toledo, Minneapolis, or elsewhere, because they started from nothing, and from the premise that they’d like to buy a little bit of everything: a couple of Chinese things, a few medieval things, and so on. While there are differences in what’s on display at American museums, de Montebello also alludes to the “sameness in their governing principles and the criteria used for acquisitions.” The great museums, he argues, “are organisms, constantly changing, and mainly expanding. The collections grow, move in new directions, and, on rare occasion, get sold off. The buildings are adapted and frequently enlarged.” A visit to a museum in itself is part of the learning process. I have found that when I have forced myself — often with the help of curators — to look at things about which I was indifferent or that even repelled me, I discovered that, with a little knowledge, what had been hidden from me became manifest. I’ll give you an example: for a long time I approached galleries of Greek vases with a sense of dread; whether black- or red-figured, the vases all looked alike to me. Museums were often culpable as they tended to show far too many. So I’d walk into one of those rooms, take one look and dash for the exit. But a curator at the Met, Joan Mertens, told me once to go to the vitrines where only fragments, or shards, were shown. She stood beside me and said, look at one of them as if it were a drawing on paper. I found I was able to look at it this way, forgetting that it was a fragment of a vessel, a three-dimensional utilitarian object. I could focus on the drawing itself, the line, the composition, and how marvellous it was. But the epiphany came when I was able to put surface decoration and vessel shape together, and look at them as one. It is the only correct way, incidentally. Fragments are a representation of the whole—to appreciate them we have to engage beyond the instant gratification we so often seek. It often takes us repressing our ego and asking for help to truly see a piece or an exhibit, much like an adult who takes classes to appreciate Shakespeare. [O]ne can be taught, and needs to taught, how to look, how to push aside one’s prejudices, one’s overly hasty negative reactions. For me, it was a long learning process, and I have to imagine that for the majority of visitors it can’t be easy either. … The appreciation of art requires an engagement that is wholly different from the instant gratification provided by most popular forms of popular culture, and museums have a responsibility to help visitors achieve this. This strikes a familiar note, as we have often called Farnam Street “curated interestingness” for the very same reason: We feel it’s our job to help you find and appreciate the best wisdom the world has to offer. Rendez-Vous with Art adds to our expanding library on art, sitting next to The Power of Art and The Story of Art.